Beautiful, passionate, a great lesson in film history! The plot of "The Artist" takes place at the time that the film lives his first big move, going from silent to talking (late 30). The film tells the story of a silent movie star - Valetine George (Jean Dujardin) - who finds himself struck by the novelty of the "talkies" arrived demanding new faces, and especially new voices. Among these new faces comes the extra Peppy Miller (Berenice Bejo), which quickly become the big star of talkies. The film revolves then around the rise of Peppy Miller and the simultaneous decay of George Valetine. 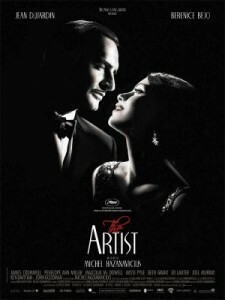 "The Artist" is a film made with care, based on aesthetic choices extremely happy, starting with black and white, which incorporates the glamorous Hollywood of the '30s. Otherwise, the film is silent, which leads us to experience the same experience told in the film. Hazanavicius rescues, so the old way of making movies, with their excellent qualifications, very well thought out plans, containing objects full of meaning, as in the stairwell of the studio scene when Valetine Peppy and Miller are. He down after he fired, and she went up, after signing the contract with the studio. A pivotal scene that marks the start of the rise and fall of one another. Beautiful, simple, smart, as in the days of silent movies. The work of Dujardin and Berenice Bejo also deserves to be mentioned and applauded. In fact, Dujardin received the best actor award at Cannes this year. Deserved! Hazanavicius's film is a beautiful homage to the cinema at a time when the cinema home to more than a great revolution, leaving the 35mm film to digital. Several scenes of the film can indeed be read as direct referrals (or homage) to large directors or major films in history. Standing out from the scene of the breakfasts, the unforgettable intertext "Citizen Kane (1941)" by Orson Welles, or the close-ups a la Eisenstein, when he begins to hallucinate. Or the actual plot of "Singing in the Rain (1952)," with Gene Kelly and Debbie Reynolds. A must-see film and displayed for all cinema lovers! Children are also welcome, but perhaps strange lack of lines and colors. ~ By Lilia Lustosa on November 20, 2011.